Schlieren (geology) are fragile, usually elongate concentrations of mafic material. A schlieren could be, for example, a tabular zone in a granite with either more or less of some of the minerals in the surrounding granite, typically the dark (mafic) minerals. 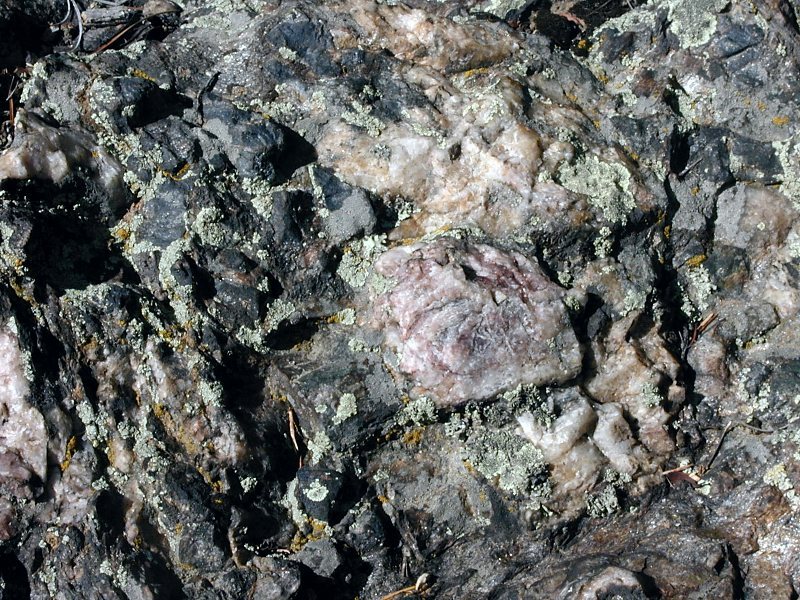 At the time of formation or crystallization of a magma chamber, mafic minerals such as biotite, rare earth elements of the lanthanide and actanide series, allanite, and the phosphate mineral apatite can orient in a preferred manner that creates bands. Schlieren bands vary in geometry ranging from deformed, tubular, planar, and rings, to arachnid (spider-like) formations. A schlieren arch is an intrusive igneous body with flow layers that occur along its borders, but which are poorly developed or absent in its interior. A schlieren dome is an intrusive body that is almost completely outlined by flow layers that culminate in one central area. 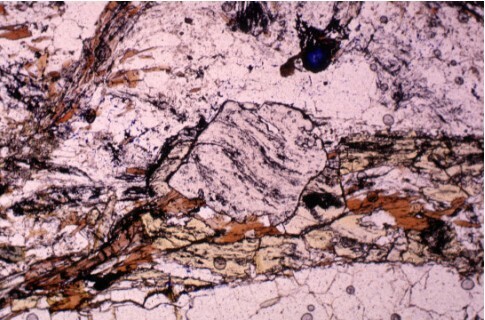 [images: schlieren in biotite-rich mantle with granodiorite inside and outside, and close-up of the margin of the schlieren; a prominent schlieren that defines a structure rather like the hinge region of an isoclinal fold, and close-up of the upper left side of the schlieren showing dark, biotite-rich prominent part of the schlieren (curving to the right) with thinner, less prominent biotite -rich streaks extending upwards (the K-feldspar phenocrysts are approximately parallel to the schlieren margin); spidery "arocknid", composed of two sprays of thin schlieren; thick portion of schlieren with irregular convex surface, parallel alignment of K-feldspar phenocrysts, and K-feldspar phenocrysts in the host granodiorite that are nearly perpendicular to the convex margin of the schlieren (top center); K-feldspar-rich mass in normal foliated granodiorite; schlieren. Schlieren (from the German for 'streaks') are optical inhomogeneities in transparent material that are not visible to the human eye. Schlieren, shadowgraph, and interferometric techniques are used to study the distribution of density gradients within a transparent medium. Shear zones involve volumes of rock deformed by shearing stress under brittle-ductile or ductile conditions, typically in subduction zones at depths down to 10-20 km. Shear zones often occur at the edges of tectonic blocks, forming discontinuities that mark distinct terranes. 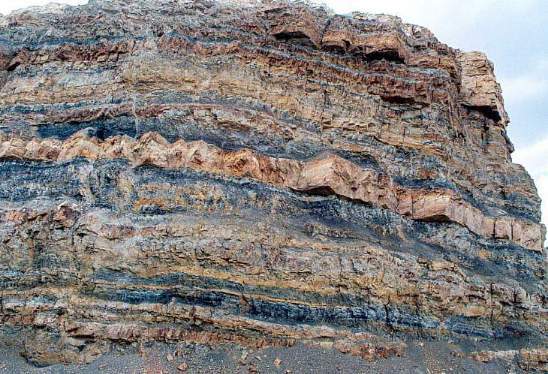 Shear zones can host ore bodies as a result of hydrothermal flow through orogenic belts, are commonly metasomatized, and often display some retrograde metamorphism from a peak metamorphic assemblage. Close to the Earth's surface, cool rocks respond to tectonic stresses with fracture and faulting. 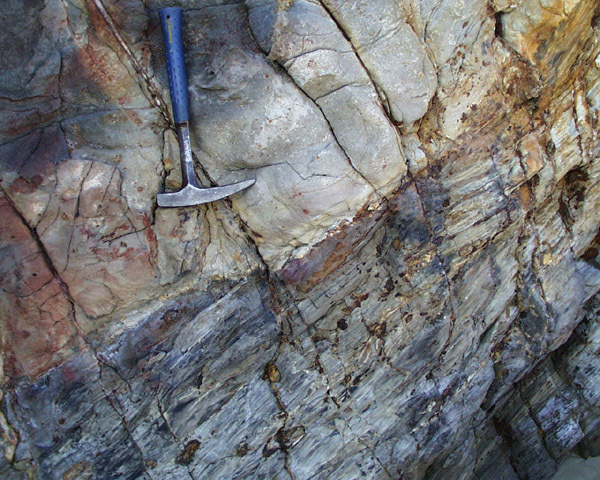 At greater depths than ductile shear zones, migmatites result from high temperature/high pressure prograde Barrovian regional metamorphism, and at still higher temperatures, rocks melt to form magmas. Transpression regimes, such as the Alpine Fault zone of New Zealand, form during oblique collision of tectonic plates and during non-orthogonal subduction. 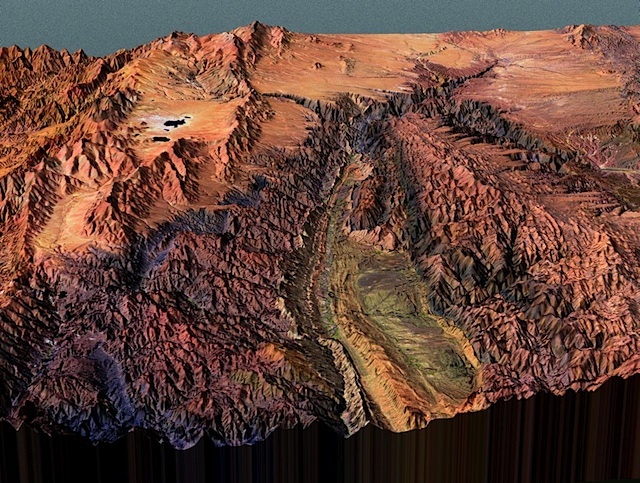 Transpression typically generates oblique-slip thrust faults, strike-slip faults, or transform faults. Microstructural evidence of transpressional regimes include rodding lineations, mylonites, augen-structured gneisses, and mica fish. Transtension regimes are oblique tensional environments that result in oblique, normal geologic faults and detachment faults in rift zones. 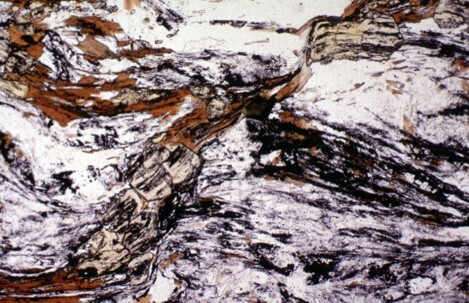 Microstructural evidence of transtension includes rodding or stretching lineations, stretched porphyroblasts, and mylonites. Shear zones can extend from centimeters to several kilometres in width, and display deformation, folding, and foliations in dynamically altered rocks (breccias, cataclasites, mylonites, S-L-L-S breccia or cataclasite is formed, with the rock milled and broken into a mélange of random fragments. Pseudotachylites form at depths from 5-10 km, where confining pressures are focused into discrete fault planes and are sufficient to prevent brecciation and milling. 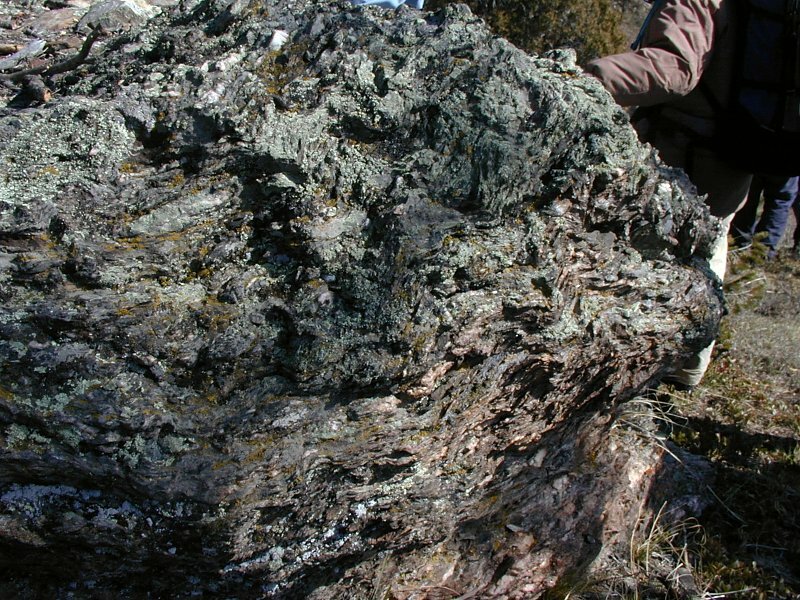 The frictional heating at these depths can melt the rock to form pseudotachylite glass or mylonite, and adjacent to these zones, can result in growth of new mineral assemblages. At greater depths, angular breccias transform into ductile shear textures and mylonite zones, as ductile shear zones accommodate compressive stress through dislocation creep within minerals, fracturing of minerals and regrowth of sub-grain boundaries, or by lattice glide along preferred orientation foliation planes in phyllosilicates. Within the depth range of 10-20km, ductile deformation conditions prevail and frictional heating is dispersed throughout shear zones, resulting in distributed deformation and a weaker thermal imprint. Here, deformation forms mylonites, with dynamothermal metamorphism observed rarely as the growth of porphyroblasts in mylonite zones. Sills are tabular slabs or concordant intrusive (plutonic) sheets of igneous rock that intruded laterally and horizontally, or nearly horizontally, as magma. Sills lie between and parallel to layers of older sedimentary rock, beds of volcanic lava or tuff, or along the direction of foliation in metamorphic rock. 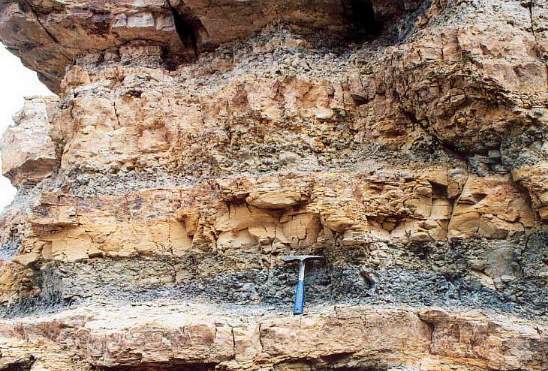 A slump (geology) is a mass movement process of slope failure, in which a mass of rock or unconsolidated material drops along a concave slip surface. Slump units move downslope as an intact block (without internal deformation of the landslide material) and frequently rotate backwards. 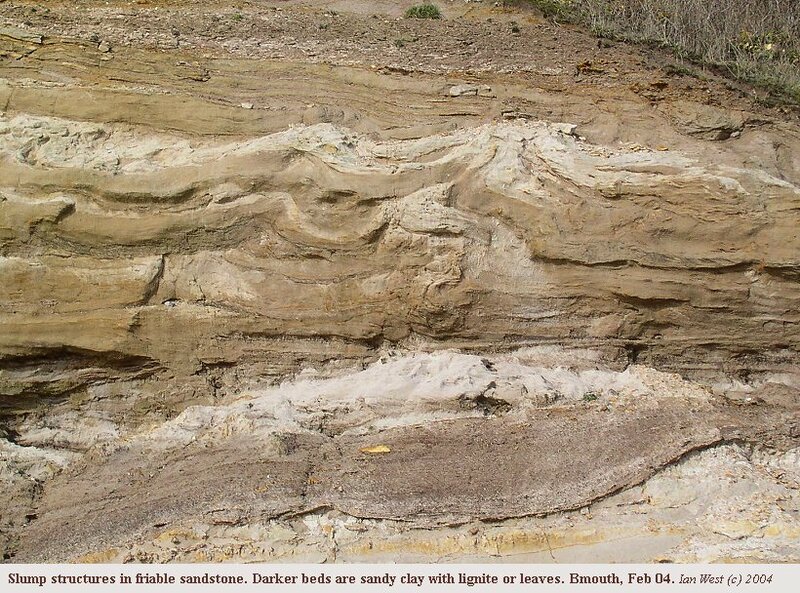 Slumps appear as discrete block movements, whereas slides usually break up and travel downslope. The term 'slump' is also used to refer to the material that breaks off in a slumping slide. 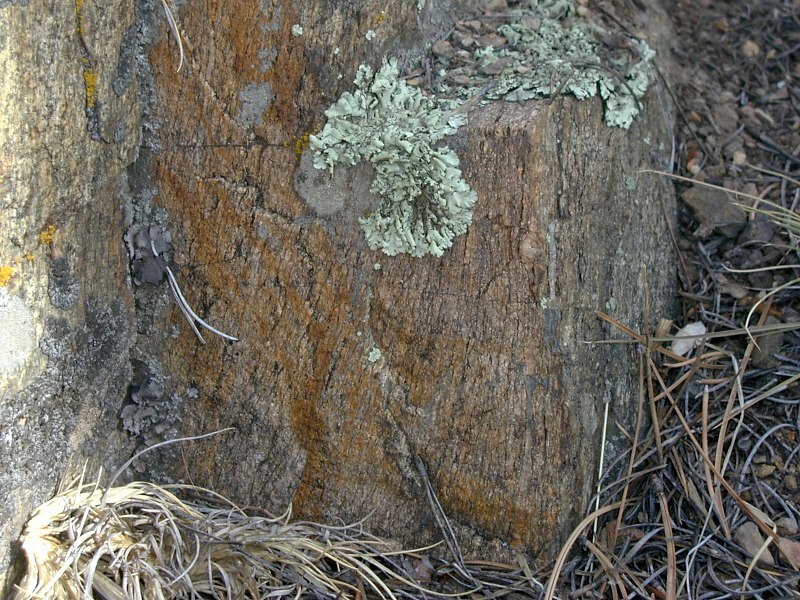 Slumps are sometimes caused by clear cutting on unstable soils, and the sagging and rotational movement of the mass of soil and rock is due in part to water infiltration and lubrication of clay-rich soils below. 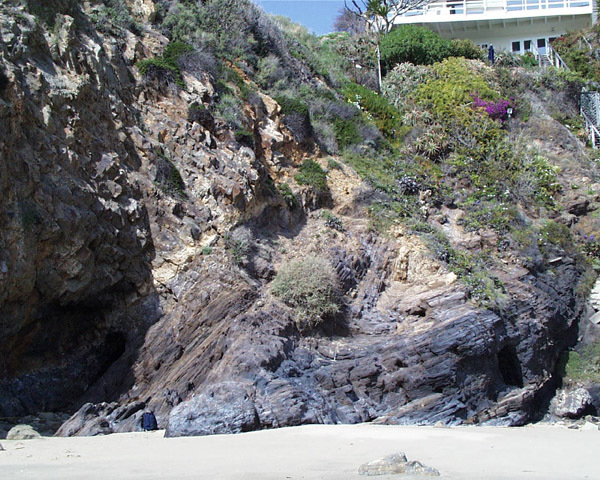 Coastal cliffs are subject to slumping when wave action undercuts lower layers. 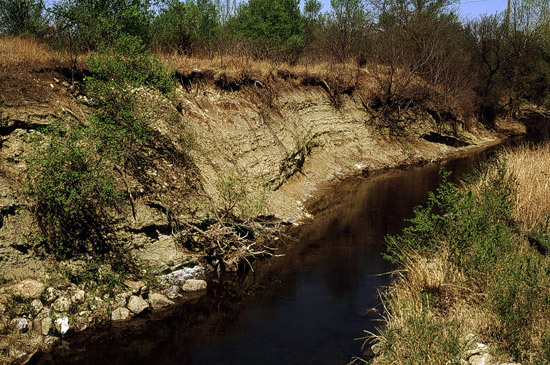 A submarine slope slump movement may be result from tidal forces acting on an unstable slope, or from a large seismic event near the affected body of water. Strata (sing. 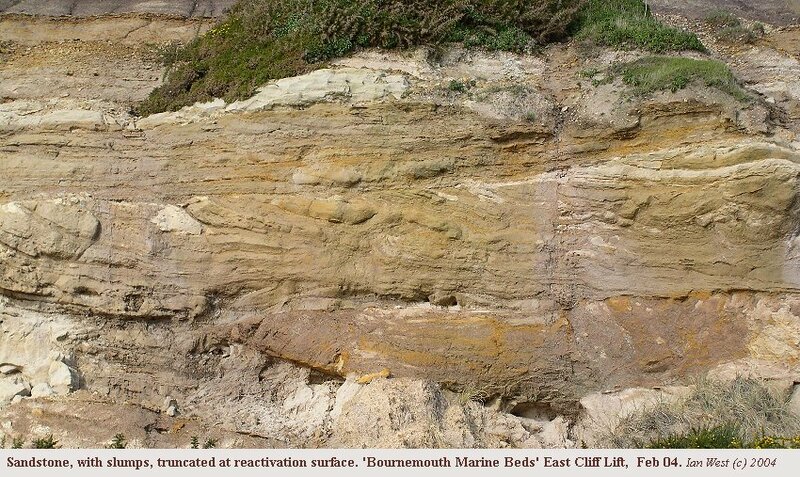 stratum) are distinctive layers or beds, of sediments or sedimentary rocks deposited consecutively, or with interruption by unconformities, atop other rocks. 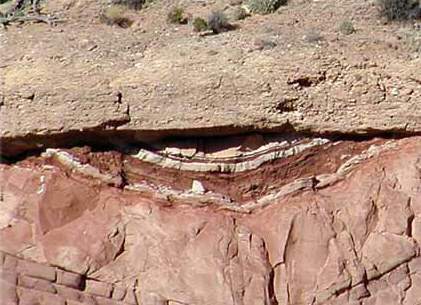 Each sedimentary stratum has approximately the same composition throughout, reflecting conditions at the time of deposition. Biostratigraphy is employed to correlate the age of rocks within strata according to their fossil assemblages. 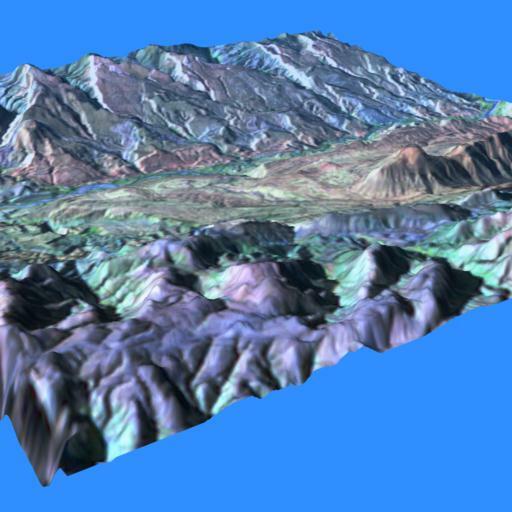 For a comprehensive glossary of terminology related to rock strata, see GGIPAC BeddingPattern (pdf) or html version. Stress is defined as a force applied over an area, and has the dimensions F/A. Shear is a stress that results from the opposition of forces that are not aligned (F/A). Strain is defined as deflection divided by the original dimension, and is a measure of deformation, that is, the differential change in size, shape, or volume of a material. Strain is dimensionless. The modulus of elasticity is stress divided by strain. 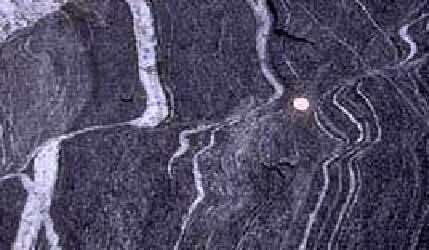 Lithostatic stress or confining pressure is uniform stress that operates equally in all directions in rocks. Confining pressure is due to the burden of overlying rock, just as seawater exerts equal pressure from all directions at depth. Differential or divertorial stress results from compressional or extensional tectonic stresses that are not equal from all directions: tensional stress (stretching), compressional stress (squeezing), or shearing stress (side to side shearing). Compressional stresses act along the direction of maximum principal stress, whereas extensional stresses act along the direction of minimum principal stress. ▪ intermediate principal stress direction is designated σ2 . Materials differ in their responses to stress, depending upon composition, conditions of temperature and confining pressure, and strain rate. However, regardless of intrinsic degrees of brittle or ductile qualities, all strained materials pass through 3 successive stages of deformation: elastic, ductile, and fracture (failure, or brittle deformation). Provided that the strain rate is sufficiently slow to allow minerals to accommodate structurally, minerals can adjust to applied stresses by a variety of mechanisms. 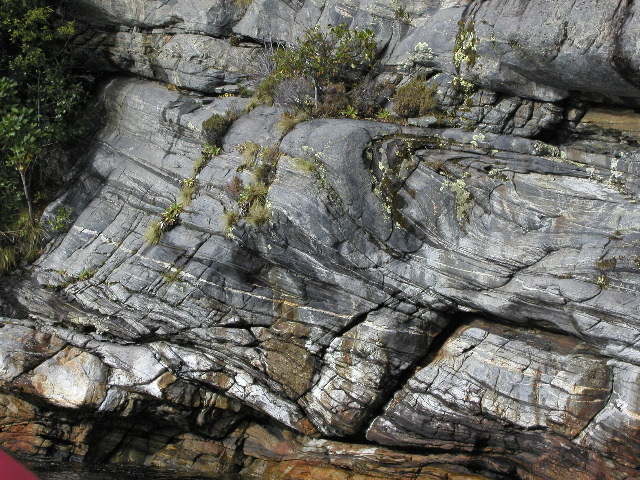 In elastic deformation, rock changes shape by a very small amount and the deformation is not permanent. Elastic deformation occurs only with small differential stresses, which are less than the rock's yield strength. 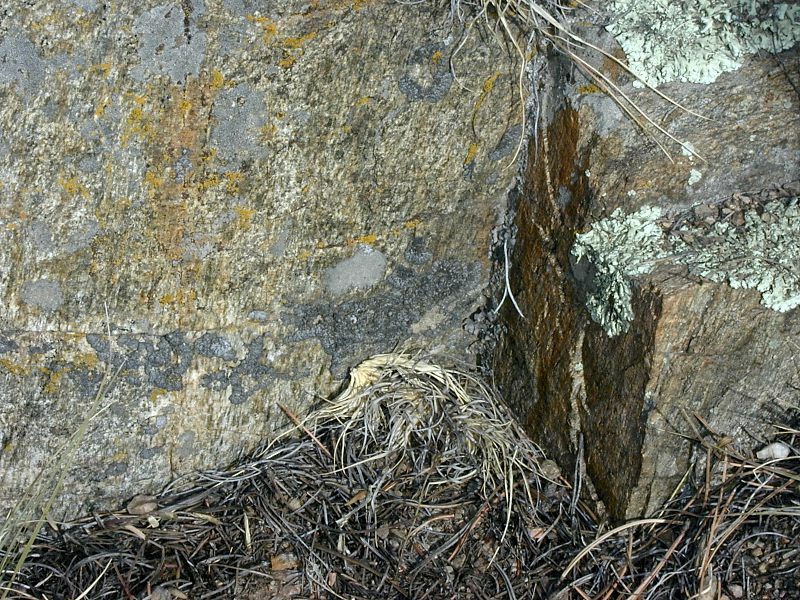 Rock adjacent to failed rock in earthquakes propagates seismic waves by elastic deformation, then springs back to its original shape in elastic rebound. For this reason, structural damage to rocks and formations provides the only evidence of passage of past seismic waves. 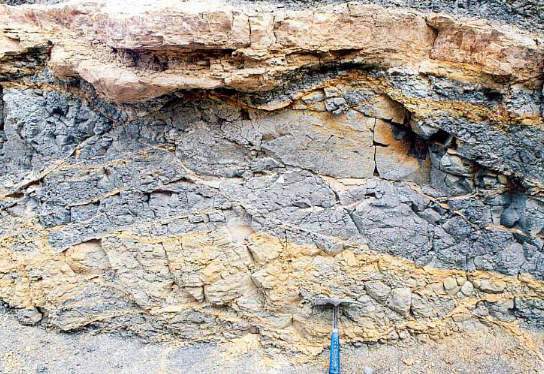 In ductile deformation, rock deeper than 10-20 km is subjected to enormous lithostatic stress, and the high temperatures of burial render the hot rock softer and more malleable. At these depths, in the lower continental crust and mantle, rock undergoes plastic deformation and flows in response to application of a differential stress that is stronger than its yield strength. Rock undergoes ductile deformation by gradual creep along crystal grain boundaries and planes within crystal lattices. 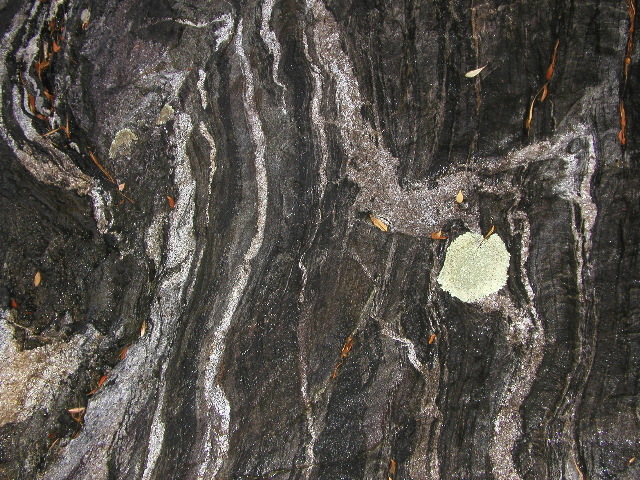 Ductile deformation in generates folding and ductile shear zone features, such the dynamic metamorphic mineralogical and textural changes seen in foliated schistose, banded, lineated, and augen-structured dynamic metamorphic rocks, mylonites, distorted porphyroclasts and mica fish, phyllonites. In brittle deformation close to the Earth's surface, where rocks are comparatively cool, rock behaves in a brittle fashion, fracturing in response to differential stress greater than the rock's yield strength. 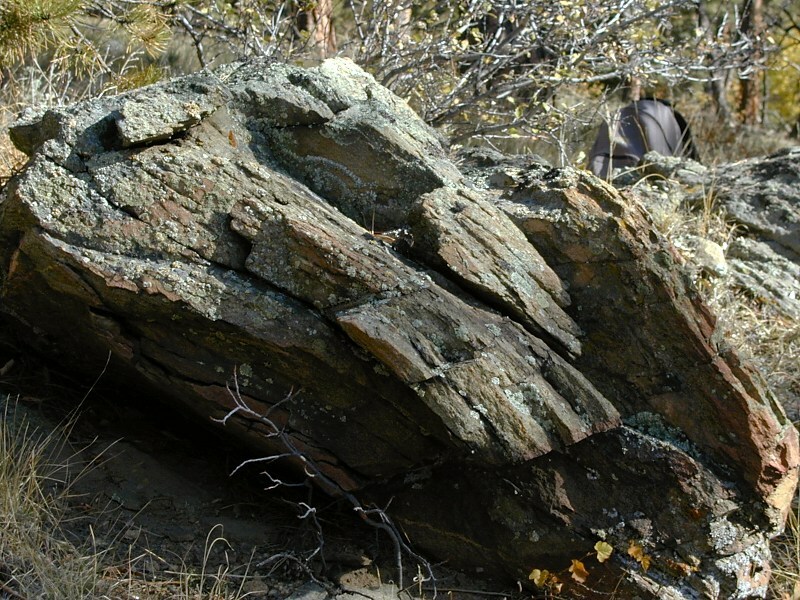 Rock failure and fracture generates faulting, brecciation, pseudotachlites, cataclasis, and slickenside striations. Rock adjacent to the failed rock springs back to its original shape in the elastic rebound that is responsible for earthquakes. 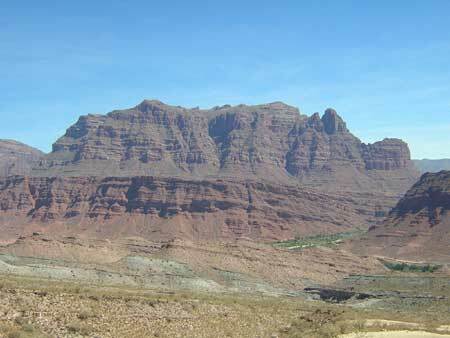 A syncline is a concave geological fold, with layers that dip downward toward the center of the structure. This arrangement is opposite to that of an arching anticline. 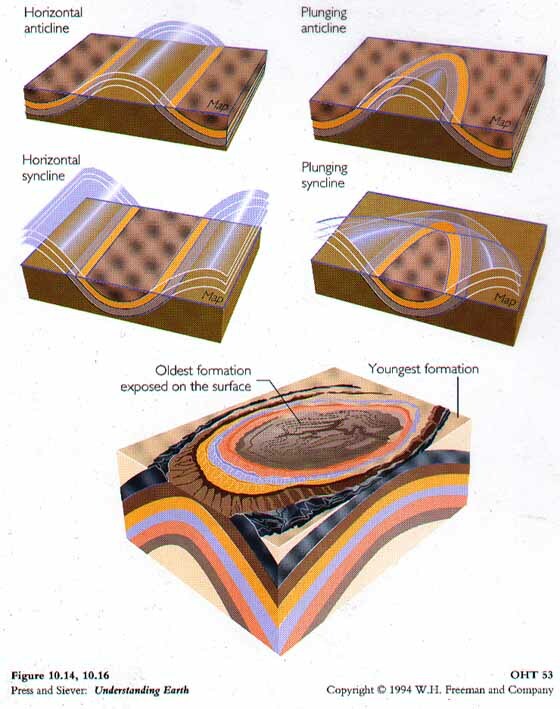 Provided that the syncline has not been overturned, strata within synclines have progressively younger rock layers toward the center of the syncline, with the youngest layer at the fold's center or hinge, mirrored by the same layers in reverse sequence on the opposite side of the hinge. Elongate circular or circular fold patterns create basin structures. 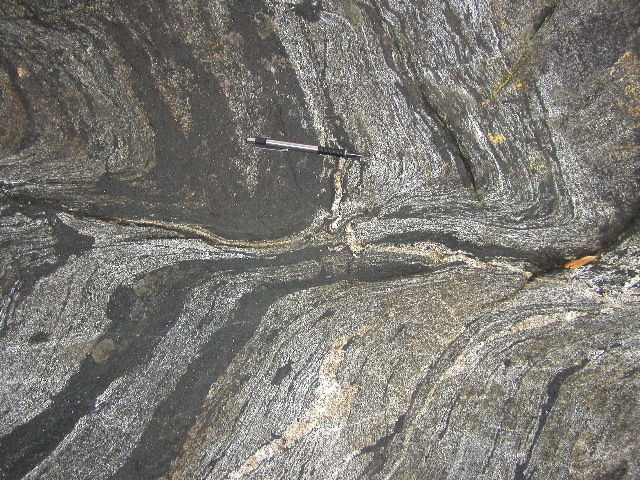 Folding typically develops during crustal deformation as the result of compression that accompanies orogenic mountain building. Strata folded as the Rocky Mountains formed. 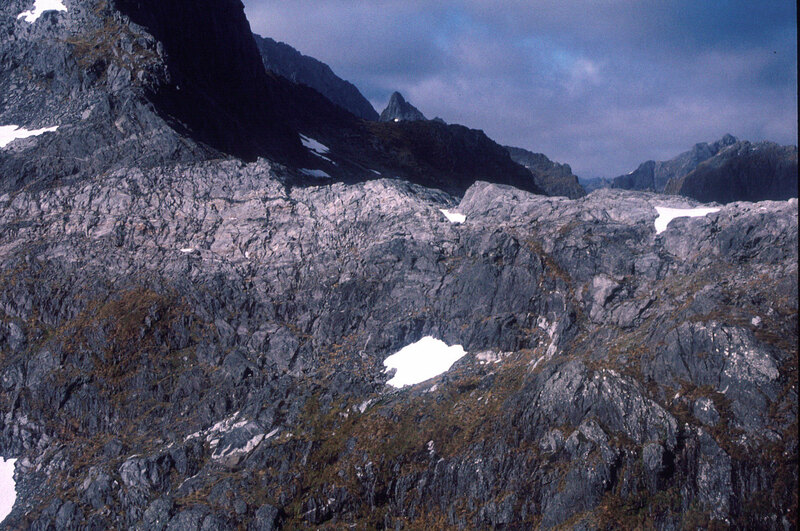 Near Mount Withrow in northeastern B.C., a prominent syncline is outlined by beds of sandstone that form ridges because they are resistant to weathering. A low area at the centre of the fold is underlain by shale, which weathers very readily. The syncline stretches off into the distance. Wyoming's Powder River Basin is another notable example of synclinal folding.